Staff Selection Commission (SSC) recruitment for the post of Postal Assistants & DEO, LDC Posts is concluding today. SSC has invited online application for the recruitment on Various posts under SSC CHSL Recruitment 2019. The SSC CHSL online application process is concluding today at 05:00 pm, April 05, 2019. 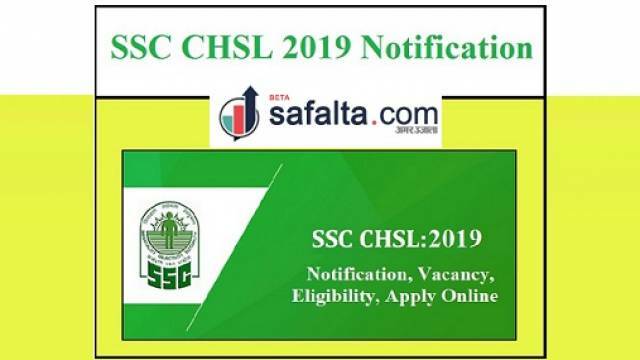 The candidates who haven't yet applied for the SSC CHSL Recruitment 2019 and are interested to apply for the recruitment drive should visit the official website now to download the official notification and check all important details including Important dates, Eligibility Criteria, Application Fee, Selection process etc. Selection will be based on the CBT and Interview. For LDC/ JSA, PA/ SA, DEO (except DEOs in C&AG): The candidates must have passed 12thStandard or equivalent examination from a recognized Board or University.